PACE is almost entirely limited to improving an already existing protein function. To evolve truly novel functions, evolutionary stepping stones are required, which can be so far created only by slowly adapting selection pressure towards the activity to be evolvedRN158. In practical terms, this means that evolving novel functions requires an extremely complex experimental setup comprising multiple, fine-tuned synthetic selection circuits applied in sequential order over many days. In most cases, it evolving a novel functionality from scratch remains a practically impossible task to be implemented in PACE. As result its complexity and various failure points, only three groups worldwide have successfully established PACE until today. Of note, two of these groups are headed by the PACE inventors Kevin Esvelt and David Liu themselves, while the third group is run by Prof. Liu’s former post doc Bryan Dickinson. In the course of our iGEM project, we were in contact with all three of these groups. We are extremely grateful for their advice and for them sharing their constructs with us, both of which was extremely important for us to get going. The goal of our work was to make in vivo directed evolution of proteins faster, easier, more robust and expand its application scope. The primary, novel application we envisioned was the in vivo directed evolution of improved and/or novel enzymes, which would be of enormous benefit for diverse industries (e.g. chemical/pharmaceutical production, biomaterial production etc. ), but remains particularly challenging with conventional directed evolution or rational engineering strategies. To reach this ambitious goal, we had to leave existing paradigms behind and rethink the concept of directed evolution. As result, we came up with a novel, highly innovative engineering concept: interfacing in vivo and in silico directed evolution by coupling PACE to deep learning of protein sequence –function relationships (Figure 2). The idea behind this concept is to fast-forward directed evolution using an intelligent algorithm. More precisely, our algorithm should enable us to skip the otherwise required evolutionary stepping stones during directed in vivo evolution by pre-evolving proteins with novel, desired target functions in silico. Figure 2: Interfacing in silico and in vivo directed evolution as novel engineering paradigm. As side note: As you will see below, we finally replaced the complex PACE-mediated evolution by the much easier PREDCEL protocol developed by us later on. But first things first. Reproduction is achieved by propagating M13 bacteriophages on E. coli host cells. Mutation is achieved during phage replication by expression of mutagenic genes. 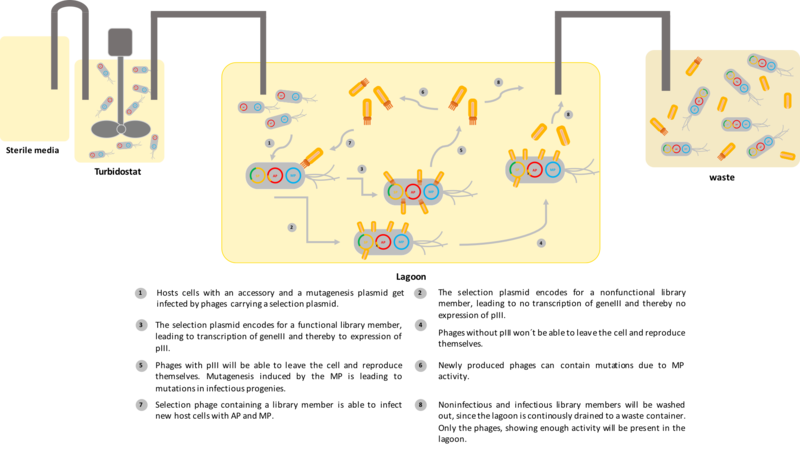 Selection is induced using synthetic circuits that couple the expression of geneIII (an essential M13 gene) to the function (“fitness”) of the phage-encoded transgene to be evolved. Reproduction is then simply achieved by starting a new computational cycle with the evolved sequence variants from the previous in silico evolution round. To validate our in silico evolution software, we designed two complementary wet lab experiments, both of which were successfully performed. We aimed at demonstrating (and eventually successfully showed), that DeeProtein can infer the impact of GAIA-induced mutations on protein function (i.e. the degree of activity). To this end, we designed ~30 beta-lactamase mutants using GAIA and correlated the DeeProtein-based “activity” scores with the in vivo measured minimum inhibitory antibiotics concentration (MIC). We aimed at demonstrating (and eventually successfully showed) that we can evolve novel functions in silico, practically from scratch. To this end, we used GAIA transfer beta- galactosidase activity onto a beta-glucoronidase parental sequence by in silico evolution. Improved, finalized Design – Learn, Evolve, PREDCEL! While setting up the PACE apparatus and protocols, we ran into a serious of recurrent problems, most importantly phage washout (i.e. complete phage loss after few hours of continuous evolution) and phage contamination (due to the complex flow setup, contaminations are difficult to avoid). We also realized, that the PACE apparatus was very static, strongly limiting its applications scope. For evolution of proteins inducible by chemical for instance, one would ideally want to instantly alternate between evolution in presence of the chemical inducer and as well as corresponding selection strains. This is impossible in a continuous flow setup. Therefore, we sought out to create a more simple and more flexible PACE alternative, which can be quickly implemented by any trained biologist without the need for special equipment or knowledge. Inspired by a recent publication on phage-mediated selection of gene libraries RN160, we created a simple protocol named PREDCEL (for phage-related discontinuous evolution), which uses simple batch-wise, manual transfer of the evolving phage gene pool (Figure 3). In essence, PREDCEL reduces the entire complexity of PACE to simple, standard laboratory procedures, all the while gaining entire flexibility to easily swap conditions (strains, inducers etc.) between individual rounds of evolution. We also provide an optogenetic tool for simple adaptation of the selection pressure during PREDCEL runs. To validate our PREDCEL method, we performed directed evolution of split T7 polymers towards improved auto-reassembly (i.e. protein interaction of the split domains). Having laid the required, solid foundation, were then able to outline a simple, fully generalizable workflow for directed evolution enzymes and successfully tested it by re-directing the catalytic activity of a promiscuous cytochrome, Cyp1A2, towards a naturally unfavored product. 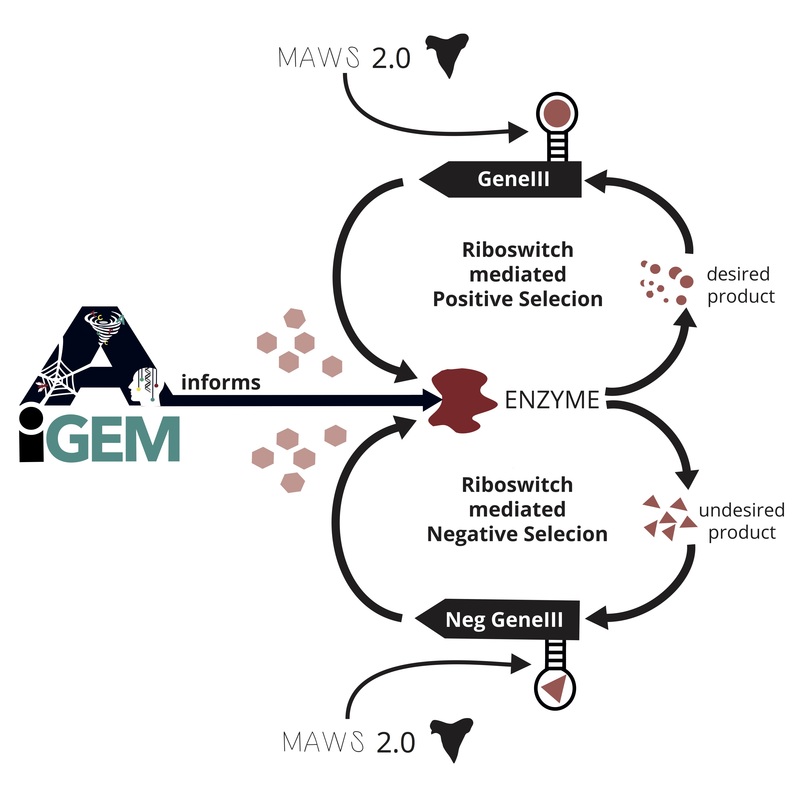 Key to this workflow is MAWS 2.0, a software originally introduced by iGEM Team Heidelberg 2015, enabling the in silico design of aptamers and corresponding riboswitches (Figure 4). We demonstrate the functionality of the improved MAWS 2.0 software, by successful design and validation of a riboswitch detecting an organosilicon product synthesized by us in vitro using an engineered cytochrome C. These riboswitches are then used for detecting the desired reaction product and mediate selection pressure during evolution by controlling the expression of M13 geneIII essential for M13 phage reproduction (Figure 4). 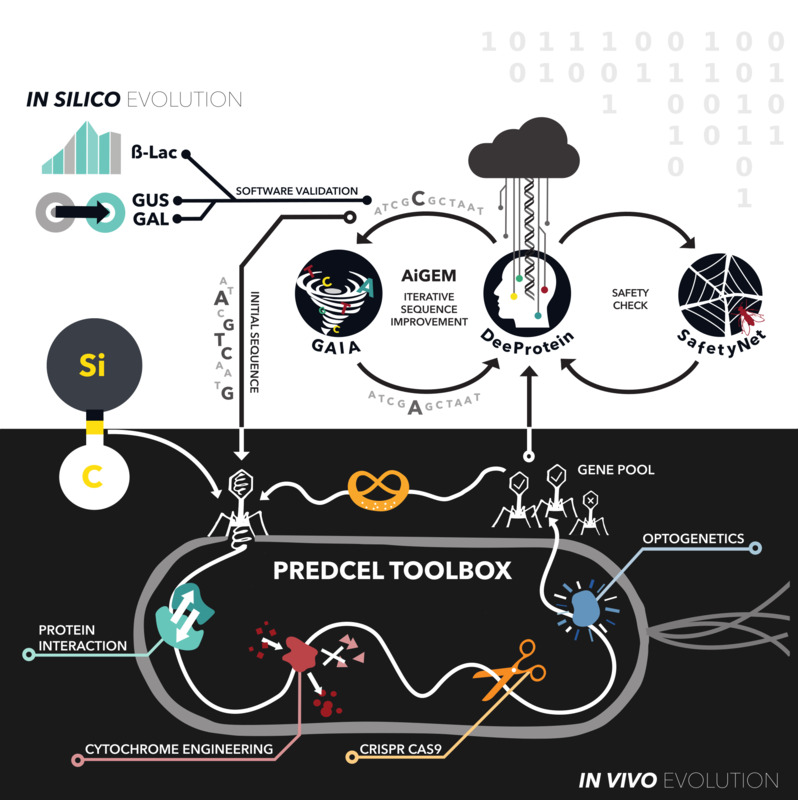 Figure 4: A fully generalizable Workflow for Engineering of improved and novel enzymes using AiGEM-mediated in silico evolution interfaced with PREDCEL-mediated in vivo evolution. 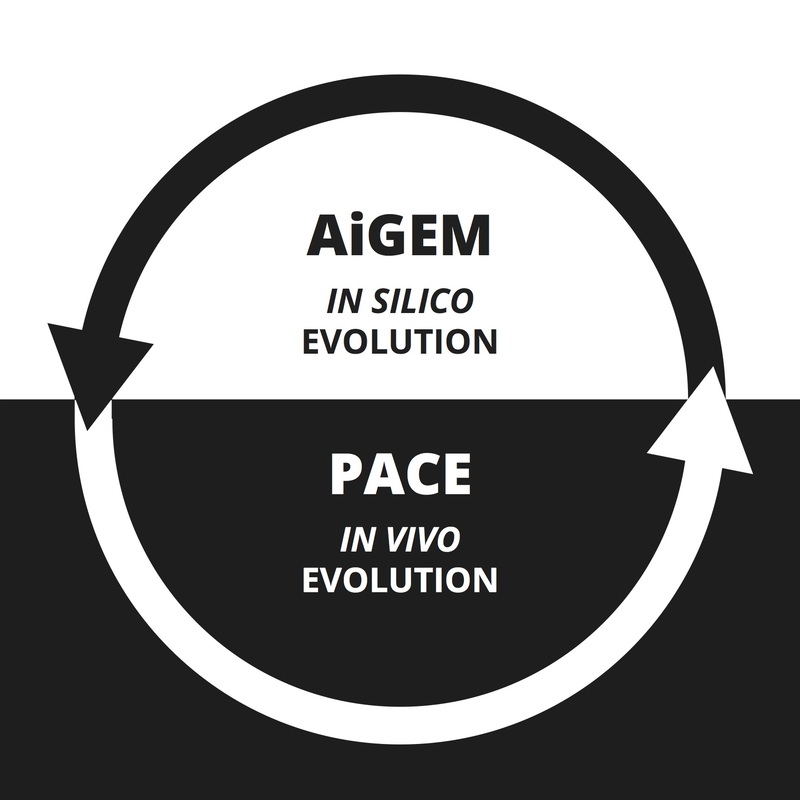 In summary, we implemented a unique in vivo – in silico evolution cycle highly accelerating the directed evolution of protein for human benefit. Our standardized PREDCEL protocol, PREDCEL parts collection, online Toolbox guide and accompanying RFC smoothly deliver our evolution toolbox to the end user. Our finalized project design is summarized in Figure 5 (a fully interactive version of this project overview figure is available under project overview). Our Results Page guides you through all subprojects carried out to establish, validate and apply our evolutionary toolbox. Taken together, we provide a foundational advance by introducing an innovative in vivo and in silico evolution interface as novel engineering paradigm to synthetic biology.